» Forum » Tech » Tech: Modern games » Judge Dredd - Unlimited Multiball? » Judge Dredd - Unlimited Multiball? Judge Dredd - Unlimited Multiball? Having a sporadic multiball issue with JD. Multiball usually starts out with the ball-save flashing for a few seconds then goes out. When you drain all but one ball, it returns to normal play. I've had a few games where the ball-save light goes off, but it continues to kick balls out for an unlimited amount of time. Eventually, the game will say Slam-Tilt, then reboot. Thanks! I'll reflow and report back. I start with changing all the transmitter optos on the transmitter trough opto board. That is where majority of the issues start on this game. Ok. I reflowed the solder on all the Optos in the ball through. Looks like the unlimited multi ball only happens during the ultimate challenge. But again, it's not every time. I'm running rom L-7 in case that has anything to do with it. I'm running on the deadworld mod rom, so that's like version L-0.1 or something. Really want a deadworld mod rom that has been fully updated. that will seem like it never stops. I get the same thing on my STTNG, it will throw you a random ball, I think just to F-- u up. My JD has a similar issue. Every once in a while a normal multiball will spit unlimited balls until the 4 judges have been destroyed and the ultimate challenge starts and then the game will go back to playing normally. I discounted it being a trough issue because of how reliable it goes back to normal. I am thinking it may be a dead world mod issue. Yours may be the same bug/glitch? The crane opto has a relatively long gap; cleaning the transmitter and receiver can help. MY JD did a multi ball on the second ball, and never lost track of balls, ran for what felt like 3 minutes straight. I have the dead world mod. Don't think its a error, just random multi ball. My JD also experiences this exact issue as described by the OP. Running L1AT with Deaworld Mod. Things have been better. With the reflowed solder on the through optos. I had one hell of a game with no unlimited multiballs. Ran through the ultimate challenge 3 times. Ended up with over 3 billion for a score. anyone know where I can get a molex connector for the 4 pin opto on the 6 ball trough of my JD? 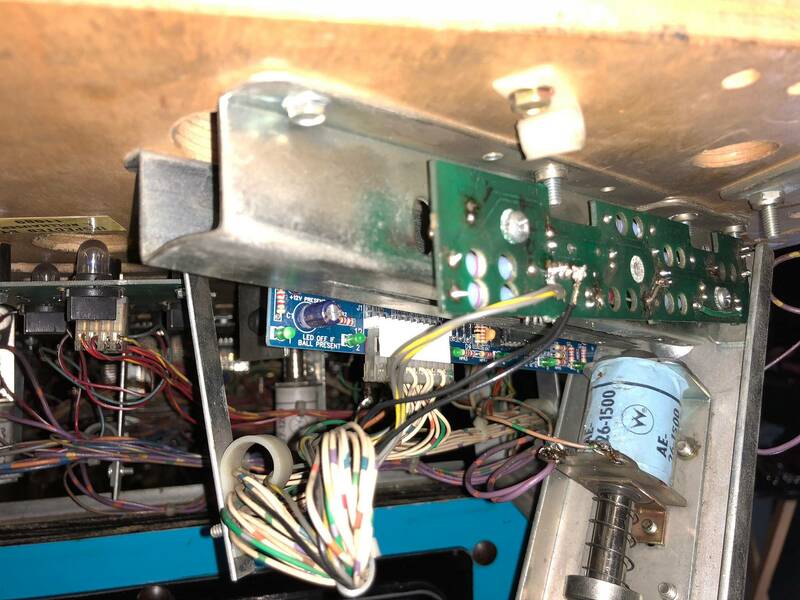 I had a dead opto causing it to keep kicking a 2nd ball into the shooter lane on every game, ordered new opto boards thru pinball life (homepin) and the larger connector works fine, but the 4 pin side, was soldered straight to the old board, bypassing the connector all together..anybody know what part number i need to re-attach a connector? Thanks so much! The plug you need is available from many places - I have linked the parts required all available from GPE below. I would be happy to post you a plug but it would probably take over a month to arrive. I had the same issues woth demolition man and it was wires going to the trough. I tested it with getting into.switch levels and knocking on various parts of the pf where vibration could kick the optos into.flickering on the levels test.